Whenever a home of Richard Lambertson and John Truex is published in a magazine, the blogosphere goes wild and an inevitable flurry of blog posts ensues. It's no surprise, of course, as Lambertson and Truex always create very chic homes for themselves. 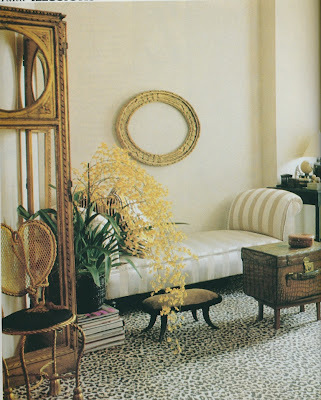 I believe that had blogging been around in 1988, we might very well have been aflutter over this apartment of Richard Lambertson, published in the November 1988 issue of House & Garden. Lambertson, who at the time was the Creative Director at Geoffrey Beene, lived in a 350 square foot apartment. Because of the apartment's small size, furniture had to be multi-functional. A 19th century fainting sofa doubled as a guest bed, while a console table with a leaf became a dining table when needed. But I have to say that it was the leopard print carpet that caught my eye. I think it's the carpet that really made the space. As you can imagine, most of the article's photos were detail shots as there weren't many potential room shots. Still, the article gives us a look at the well-edited and chic style of the budding handbag designer extraordinaire. And by the way, thanks to my friend Aida, I had the opportunity to meet Mr. Lambertson here in Atlanta, and he is as nice as he is chic! In the living space, a sofa did double duty as a guest bed. An antique alligator suitcase resting on a tea tray served as a coffee table. 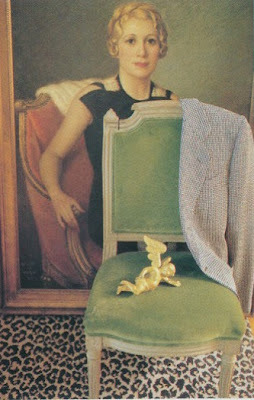 A Louis XVI chair in front of a portrait purchased at a flea market. Lambertson used an Hermès scarf as a pillow cover which he had quilted. 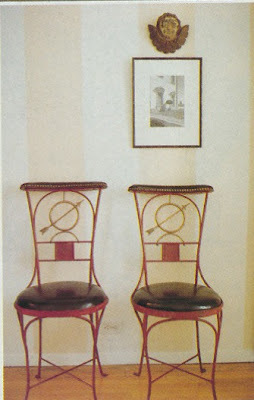 French Directoire chairs against a wall. A twig table held bibelots. All images from House & Garden, November 1988, Michael Mundy photographer. I have been a fan of spotted carpet since visiting the Grand Trianon at Versailles as a student in 1975. Although commenters on other blog sites fail to find the allure, I find it a classic. 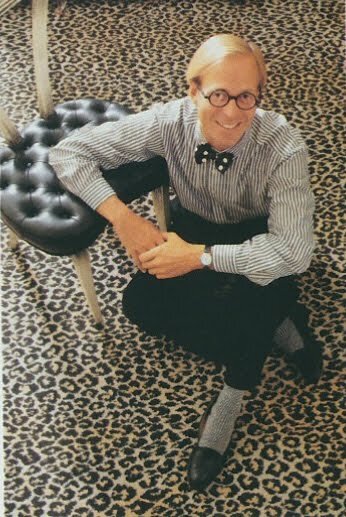 I too am a fan of the leopard print carpet, so much so that I have it throughout my apartment. I agree that it's a classic!